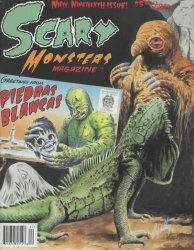 Scary Monsters magazine #19 - Greetings from Piedras Blancas! MyMovieMonsters.com > Scary Monsters Magazine > Scary Monsters 1-100 > Scary Monsters magazine #19 - Greetings from Piedras Blancas! This is the Nifty Nineteenth issue of Scary Monsters, published in June 1996. Each copy is new, uncirculated and picked directly from the printer's shipping carton. Revenge of the Merchants of Menace "Hammer Goes Psycho"
The Beast With 1,000,000 Eyes! Two-color cover and 122 B&W pulp inside pages.